I have a ton of stuff on my mind, really want to blog, have about a dozen draft posts “in process”, but have church and family duties that are currently taking precedent. I’ve been somewhat working through the Strange Fire conference media at a snails pace. I’ve been reading some of Sam Storms writing in response to the issue. I’ve been slowly working through Frank Viola’s book-length response to Strange Fire (the PDF will be taken down in around a week and a half, so grab it now!). I got a package in the mail from a wonderful new friend who is very gracious to me that contains a book I’ve been trying to put down at night. I’ve started 2 rather large projects related to Strange Fire. This entry was posted in Reblogged Guest Post on November 6, 2013 by Truth2Freedom. We all dream of the perfect relationship. You know, the one that’s free of disagreement, conflict, communication difficulties, power battles, anger and control. We can envision what it would be like. The problem is, none of us ever get what we were once able to imagine. When we wake up from our dreams, we’re all greeted by the reality that all of our relationships live in the same location – the fallen world – and all of our relationships are with the same kind of people – imperfect human beings (I’ll remind you again, you’re one of those too!). Now you just have to ask why God would choose to subject us to such difficulty and disappointment. Is there meaning in the mess? Is there mercy in the mess? Maybe right now you’re facing things in one of your relationships you never imagined you’d face. Maybe right now you’re dealing with such deep hurt and disappointment that you simply don’t know what to do. Have you wondered what in the world God is doing? Have you been tempted to doubt his goodness and question his love? Acts 17 tells us that God determines the exact place where we’ll live and the exact length of our lives. Your life isn’t out of control. What you’re facing isn’t the result of God forgetting you. God hasn’t turned his back on the promises he made to you. I know it’s hard to grasp, but what you’re facing is the result of God being faithful to his promises to you. Psalm 46 tells us that “God is our refuge and strength, a very present help in trouble.” If you’re God’s child, you’ve never been in a location all by yourself. If you’re God’s child, you’ve never been in a relationship all by yourself. You’ve never endured difficulty in isolation. Why? Because God is always with you and he’s there so that you would have a place to run (“refuge”) and help in your moments of greatest discouragement and weakness (“strength”). Here’s the mistake we make in the way we attempt to make sense out of lives. We think that the mess is a sure sign that God isn’t working in our lives, because if he were at work, we wouldn’t be in such a mess. The Bible tells us something completely different. It tells us that because God loves us so, he’s not satisfied with us as we are. He looks down at us and sees many areas where change and growth are needed. He couldn’t love us and be willing to leave us in our immaturity and weakness. So God takes us where we don’t want to go in order to produce in us what we couldn’t achieve on our own – character. And how does he do this? He uses the difficult experiences of life to expose and change our hearts. One of his main tools is our relationships. These messy relationships expose our hearts, bring us to the end of ourselves and cause us to reach out for the help that only Jesus can give us. I know it’s hard to face the hurt and disappointment of a relationship gone bad. But there is hope. You’re never alone. The One who’s with you is up to something very good and because he is, there really is mercy to be found right smack dab in the middle of the mess! Where are you experiencing relational conflict and difficulty? Are you shifting all responsibility to the other person, or are you humble enough to admit that your flaws are a factor for the mess? Do you wish you lived at a “different address”? How is God using your specific location for your redemption? How can the Person of Jesus Christ – with you in the middle of your relational difficulty – help you in your relationships? This entry was posted in Biblical Lesson/Teaching on November 6, 2013 by Truth2Freedom. What is ‘the Apostasy’ Mentioned in 2 Thess. 2:3? At least a few pre-trib teachers have put forth the idea that “the apostasy” (also sometimes translated “the departure”) really means the rapture itself. More credible, scholarly sources dismiss that idea as eisegesis, something being read into the text. EDITOR’S NOTE: This is the fifth story in a seven-part series by veteran journalist Troy Anderson about major evangelists who are turning their attention toward America to help ignite what Billy Graham describes as an end-times “great spiritual awakening.” The first story featured Graham’s warning for America and the second centered on another famed evangelist’s testimony that God spoke to him in a dream last year saying, “America will be saved!” In the third story, Graham told of his fervent prayers for a “fresh awakening” in America. In the fourth, Graham sounded the alarm that the Second Coming is “near” and signs of the end of the age are “converging now for the first time since Jesus made those predictions.” In the fifth, prophecy scholar Paul McGuire warned America is at a spiritual crossroads. The sixth article recounts the many inspirational stories and extraordinary measures hundreds of thousands of people in America are taking to spread the news of Graham’s special Gospel presentation Nov. 7. This entry was posted in Truth2Freedom Headline Alerts on November 6, 2013 by Truth2Freedom. Christianity is facing an identity crisis that boils down to one question: Who is God? Questions about Parables: What is the meaning of the Parable of the Rich Fool? So the point of the Parable of the Rich Fool is twofold. One, we are not to devote our lives to the gathering and accumulation of wealth. There is an interesting point made in the parable. God says to the man in the story, “and the things you have prepared, whose will they be?” This echoes the thought expressed in Ecclesiastes 2:18 (“I hated all my toil in which I toil under the sun, seeing that I must leave it to the man who will come after me.”). You see it all the time in people who are singularly devoted to the accumulation of wealth. What happens to all that wealth when they die? It gets left behind to others who didn’t earn it and won’t appreciate it. Furthermore, if money is your master, that means God is not (Matthew 6:24). The second point of the Parable of the Rich Fool is the fact that we are not blessed by God to hoard our wealth to ourselves. We are blessed to be a blessing in the lives of others and we are blessed to build the kingdom of God. The Bible says if our riches increase, we are not to set our hearts upon it (Psalm 62:10). The Bible also says there is one who gives freely and grows all the richer (Proverbs 11:24). Finally the Bible says we are to honor God with the first fruits of our increase (Proverbs 3:9–10). The point is clear, if we honor God with what he has given us, He will bless with more so that we can honor Him with more. There is a passage in Second Corinthians that summarizes this aptly (2 Corinthians 9:6–15). In that passage Paul says, “And God is able to provide you with every blessing in abundance, so that having all contentment in all things at all times, you may abound in every good work.” We are blessed by God, so we can in turn “abound in every good work” and be a blessing in the lives of others. So if God has blessed you with material wealth “set not your heart on it” and “be rich toward God.” That is the message of the Parable of the Rich Fool. This entry was posted in Parables Questions, Questions & Biblical Answers on November 6, 2013 by Truth2Freedom. Questions about the Bible: Is the Original Bible Still in Existence? The answer to this question is both “no” and “yes.” In the strictest sense, no, the original documents that comprise the 66 books of the Bible—sometimes called the “ ‘autographs”—are not in the possession of any organization. However, in a very real way, yes, humankind does have the actual words and books that make up the Word of God. How can this be? To gain an understanding of how the original Bible was written and how it compares to what is read today, it’s necessary to look at the process the resulted in its original compilation and what has happened since that time. According to skeptics, there has never been a true “original” Bible. For example, Dan Brown’s fictional book The Da Vinci Code has his storyline ‘expert’ say the following about the Bible: “The Bible did not arrive by fax from heaven.… The Bible is the product of man, my dear. Not of God. The Bible did not fall magically from the clouds. Man created it as a historical record of tumultuous times, and it has evolved through countless translations, additions, and revisions. History has never had a definitive version of the book.” Brown’s charge does indeed belong in a work of fiction because the assertion is simply not true. It is correct that the Bible was written over a long period of time. Written by 40 authors over a period of some 1,500 years, the Scriptures are made up of 66 books—39 in the Old Testament and 27 in the New. 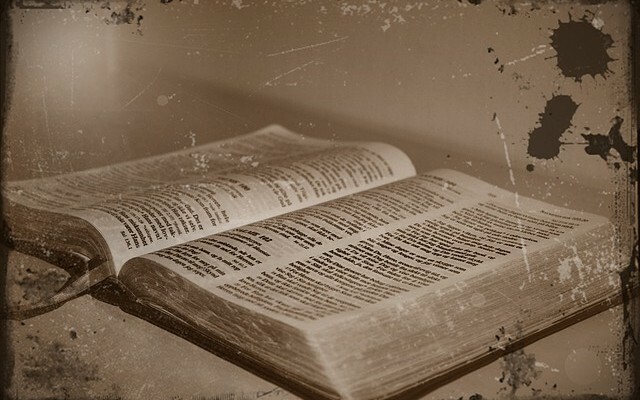 The Old Testament is oftentimes divided into three sections: (1) The Pentateuch, which is sometimes referred to as “The Law” and includes the first five books of the Bible; (2) The Prophets, which includes all the major and minor prophetic writings; (3) The Writings, which includes Psalms, Proverbs, and a number of other books. The New Testament is also divided into three segments: (1) The Gospels; (2) Church History, which basically includes just the book of Acts; (3) The Apostolic Writings, which includes everything else. How was the original Bible as described above compiled? Its assemblage can be traced through Scripture in a fairly accurate manner. After Moses wrote the Pentateuch (Exodus 17:14; 24:4, 7; 34:27; Numbers 33:2; Joshua 1:8; Matthew 19:8; John 5:46–47; Romans 10:5), it was placed in the Ark of the Covenant and preserved (Deuteronomy 31:24). Over time, other inspired texts were added to the first five books of the Bible. During the time of David and Solomon, the books compiled until that time were taken and placed in the temple treasury (1 Kings 8:6) and cared for by the priests who served in the temple (2 Kings 22:8). More books were also added during the reign of King Hezekiah—David’s hymns, Solomon’s proverbs, and prophetic books such as Isaiah, Hosea, and Micah (Proverbs 25:1). In general, as the prophets of God spoke and their words were written down, they were included in what today is the Old Testament. In the third century B.C., the Old Testament books were translated into Greek by a team of 70 Jewish scholars, with the finished work being called the LXX (which stands for “70”), or the Septuagint (a Latin word derived from phrase “the translation of the seventy interpreters”). The Septuagint was certainly used and quoted by the Apostles, including Paul, in their writings. The oldest manuscripts of the LXX include some 1st and 2nd century B.C. fragments. In 1947, the Dead Sea Scrolls were discovered in the area of Qumran in Israel. Modern dating techniques state the age of the scrolls to be (depending on the scroll) anywhere from the 5th century B.C. to the 1st century A.D. Historians believe the Jewish scribes maintained the site to preserve God’s Word and most certainly to protect the writings from the destruction of Jerusalem that occurred in A.D. 70. The Dead Sea Scrolls represent nearly every book of the Old Testament and comparisons with modern copies that exist today show them to be virtually identical, with the main deviations being the spellings of some individuals’ names and various numbers quoted in Scripture. The Dead Sea Scrolls are a testimony to the accuracy and preservation of the Old Testament and provide confidence that the Old Testament existing today is the same Old Testament as that which used by Jesus. In fact, Luke records a statement made by Jesus regarding the assemblage of the Old Testament: “For this reason also the wisdom of God said, ‘I will send to them prophets and apostles, and some of them they will kill and some they will persecute, so that the blood of all the prophets, shed since the foundation of the world, may be charged against this generation, from the blood of Abel to the blood of Zechariah, who was killed between the altar and the house of God; yes, I tell you, it shall be charged against this generation’ ” (Luke 11:49–51, emphasis added). Jesus confirmed the 39 books of the Old Testament in these verses. Abel’s death is found in Genesis and Zechariah’s in 2 Chronicles 24:20–21, which, from an ordering perspective, is the last book in the Hebrew Bible. Dan Burstein, in his book Secrets of the Code (a book similar to Dan Brown’s book), says this about the New Testament: “Eventually, four Gospels and twenty-three other texts were canonized into a Bible. This did not occur, however, until the sixth century.” Is this assertion true? Actually, it is 100% false. The truth is the composition of the New Testament was officially settled at the Council of Carthage in A. D. 397. However, the majority of the New Testament was accepted as authoritative much earlier. The first collection of New Testament books was proposed by a man named Marcion in A.D. 140. Marcion was a docetist (docetism is a system of belief that says all spirit is good and all material matter is bad), and so Marcion excluded any book that spoke of Jesus being both divine and human, and he also edited Paul’s letters to match his own philosophy. The next proposed collection of New Testament books on record was the Muratorian Canon, dated A.D. 170. It included all four gospels, Acts, 13 of Paul’s letters, 1, 2, 3 John, Jude, and Revelation. The final New Testament Canon was first identified by the church father Athanasius in A. D. 367 and ratified by the Council of Carthage in A. D. 397. But history shows that the actual New Testament read today in modern Bibles was recognized much earlier and that it is an exact reflection of what the “autographs” contained. First, Scripture itself shows that the writings of the New Testament were considered inspired and on a par with the Old Testament. For example, Paul writes, “For the Scripture says, ‘Do not muzzle the ox while it is treading out the grain,’ and ‘The laborer is worthy of his wages’ ” (1 Timothy 5:18, emphasis added). The latter quotation is from Luke 10:7, which shows Paul considered Luke’s Gospel on par with Scripture as a whole. Another example includes a statement made by Peter: “Bear in mind that our Lord’s patience means salvation, just as our dear brother Paul also wrote you with the wisdom that God gave him. He writes the same way in all his letters, speaking in them of these matters. His letters contain some things that are hard to understand, which ignorant and unstable people distort, as they do the other Scriptures, to their own destruction” (2 Peter 3:15–16, emphasis added). It is clear from Peter’s quote that he regarded Paul’s letter equal to the Old Testament canon. Second, quotations exist from the early church fathers that allow the near reconstruction of the entire New Testament as it is found today. For example, Clement (c. A.D. 95) quotes from 11 New Testament books, Ignatius (c. A.D. 107) quotes from nearly every New Testament book, and Polycarp (a disciple of John, c. A.D. 110) quotes from 17 New Testament books. Working with early church fathers’ quotes, the entire New Testament can be pieced together with the exception of some 20–27 verses, most of them from 3 John. Such evidence provides witness to the fact that the New Testament was recognized far before the Council of Carthage in A. D. 397 and that the New Testament reflects today what was written 2,000 years ago. In summary, it can be said that while the original autographs of the Old and New Testaments are not in the possession of anyone today, because of the all the copies that exist and the work that has been done by biblical historians via the science of textual criticism (which seeks to restore the Bible to its original autographs), there is no loss of confidence among competent scholars that today’s modern Bible reflects the Old and New Testament writers’ work. As an analogy, if the original and preserved unit of measure known as a “yard” was lost in a fire in its holding place in Washington, D.C., there is little doubt that that measurement could be replaced with full assurance through all the exact copies of it that exist elsewhere. The same is true of God’s Word. This entry was posted in Bible Questions, Questions & Biblical Answers on November 6, 2013 by Truth2Freedom. Questions about Angels and Demons: Who Are the Four Living Creatures in Revelation? The four living creatures are found in Revelation 4:6–9, 5:6–14, 6:1–8, 14:3, 15:7, and 19:4. The texts that describe these creatures do not indicate that they are figurative—they are real, actual beings. The four living creatures (literally “beings”) are a special, exalted order of angelic being or cherubim. This is clear by their close proximity to the throne of God. Ezekiel 1:12–20 suggests that they are in constant motion around the throne. Revelation 5:6–14 describes the duties or purposes of the four living creatures. They fall down and worship the Lamb, Jesus Christ, offering the same reverence to Him that they did to the Father (Revelation 4:10), proof positive of the deity of Jesus Christ. Along with the 24 elders, they have “harps and golden vials full of incense, which are the prayers of the saints.” Harps are frequently associated with worship in the Old Testament, as well as with prophecy (2 Kings 3:15; 1 Chronicles 25:1). Incense represents the prayers of the saints. Therefore, taken together the four living creatures and 24 elders hold in their hands all that prophets ever prophesied and believers ever prayed for—all about to come to pass. The purpose of the four living creatures also has to do with declaring the holiness of God, leading in worship and adoration of God, and they are involved in some way with God’s justice, for when He opens for first four seals and sends out the four horsemen to destroy, their powerful voices, like thunder, command “come” (6:1–8). The horsemen respond to the summons of the four powerful creatures, indicating the power the creatures possess. That power is seen again in Revelation 15:7 when one of the four unleashes the last seven plagues of God’s wrath on mankind. The four living creatures are very similar, if not the same, beings as those in Ezekiel 10:2, 14, and 20 and Isaiah 6:1–3. They are four in number, full of eyes, have faces like the beings in Ezekiel 1:10, six wings (Isaiah 6:2), and offer worship as the beings in Isaiah 6:3, saying “holy, holy, holy is the Lord.” They may not be the exact same beings, but they definitely are comparable and probably of the same order. In summary, these beings are an exalted order of angels whose purpose is primarily that of worship (Revelation 19:4). They are very similar to the beings in Ezekiel 10 and Isaiah 6:1–3, and they are in some ways involved in God’s divine justice. This entry was posted in Angels/Demons Questions, Questions & Biblical Answers on November 6, 2013 by Truth2Freedom. Breitbart.com reports: “The man who calls himself Abu Muslim sits with his fellow fighters, members of the group Katiba al Muhajireen, and raises his rifle for the camera. He has come to Aleppo to fight, he tells the man who has come to interview him for Britain’s Channel 4. A Muslim convert, he–like some 100 others joining the jihad in Syria’s civil war–has left his family at home. In Canada. The United States’ neighbor to the north is experiencing a radicalization problem, according to a confidential report by the Canadian Security and Intelligence Service (CSIS). Made public earlier this year through a Freedom of Information Act request filed by Canada’s National Post, the report confirms that ‘Islamist extremists are now radicalizing Canadians at a large number of venues,’ ranging from mosques to dinner parties and even the family home. Who, or what, is behind the “purge” of top-level U.S. military officers during the Obama administration, with estimates of the number of senior officers fired during the last five years edging toward 200? According to Retired Army Maj. Gen. Paul E. Vallely, formerly the deputy commanding general of the Pacific Command, who has served as a Fox News senior military analyst , a good part of the blame belongs to Obama’s close adviser, Valerie Jarrett. Rampant “political correctness” due to her influence, Vallely tells WND, is now permeating the military and negatively affecting everyone from top generals to the ranks of the enlisted. The Falling Away: Has It Happened? But for Christians, there is one prophecy that is at the top of the list.It tells us that prior to the Tribulation, something called “a falling away” must come. In the light of many other prophetic developments, this event seems to be in the process of happening at the present time. But we must ask: Is this really true, and how will we know when it has reached completion. In other words, how much worse must things get before Paul’s prophecy is fulfilled? The Obama Mess: Who Did It? We Did It? We, the people elected him. That’s the point hardly ever acknowledged amid all the shouting and counter-shouting that drown Washington, D.C. in perpetual racket. We twice, not just once, armed him, escorted him to the White House, opened the front door for him, said, in effect, go to it. There is a phenomenon that is rarely commented on, although it’s as common as it is significant. There is no shortage of ways in which people today claim the Lord of the universe has spoken personally and directly to them outside of Scripture. These professions of personal revelation are perhaps one of the most dangerous daggers being wielded in the visible church today. Once the man (or worse, the woman) on stage or behind the pulpit claims that he (or she) has received a personal word from the Lord, the authority of God’s true revealed Word as found in Scripture is thrown under the proverbial bus. After all, who can argue with “Thus saith the Lord”? And if God allegedly has told one person one thing and another person a contradicting thing, how is one to know who has the true word? All reason and truth becomes relative to each individual’s experience and the only truth that can be known and trusted—God’s Word—is placed back onto the bookshelf or coffee table to collect dust while the more vivid and emotional experiences rock the professing believer to and fro. This entry was posted in Postmodern Church/Apostasy on November 6, 2013 by Truth2Freedom.